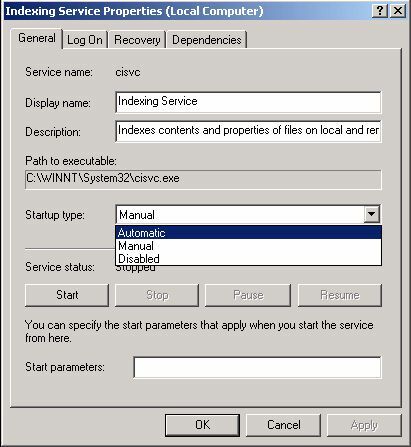 The Indexing Service is not started by default on a Windows 2000 professional computer. If you want the Indexing service to start automatically, select Start | Settings | Control Panel | Administrative Tools and open the Computer Management application. 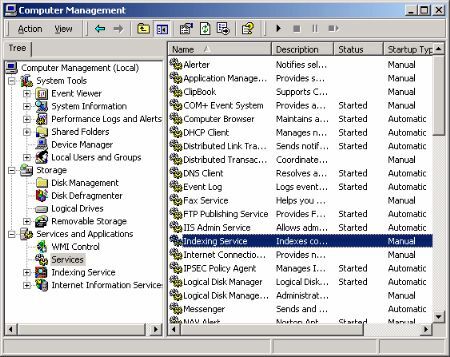 In the right pane of the Computer Management window, click on Services and Applications, then click on services. In the list of services, right-click on Indexing Service, The Indexing Services Properties dialog box will appear. In the Indexing Services Properties dialog box, on the General tab select Automatic from the Startup type: drop-down list. Under Service stautus: click on the Start button. A flurry of hard disk activity may begin as the Indexing Service builds or updates the index. The Indexing service creates an index (also called a catalog) organized in a way that makes it quick and easy to search. The Indexing Service also records the documents properties, for example its date of creation and last modified date.